The extended talks on the Iranian nuclear issue may wrap up on Wednesday, Iran’s negotiators said. But Tehran insists the lifting of international sanctions was the first step in the deal currently being bargained in Switzerland. “We insist that the lifting of financial, bank and oil industry sanctions was the first step and on a clear roadmap for lifting the rest of the sanction,” Abbas Araqchi, Iranian deputy FM told the media. The statement comes as hard negotiations on the Iranian nuclear controversy in Lausanne passed the Tuesday midnight deadline and continued. The foreign ministers of China, Russia and France left the country saying they would return if necessary. French FM Laurent Fabius remarked that while the talks produced progress, it was not enough to reach a deal. German Chancellor Angela Merkel said a deal would only be possible once all points of disagreement are settled. 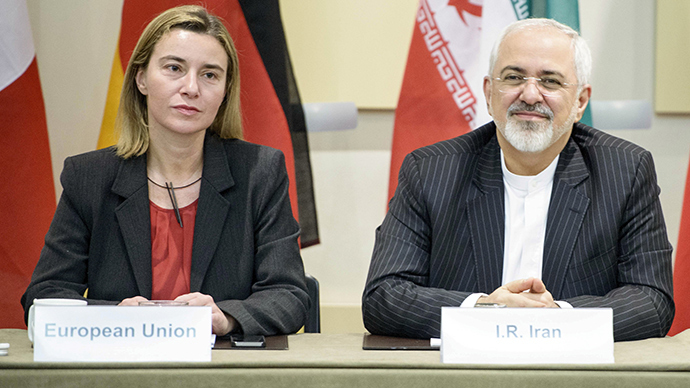 Iran and six world powers are negotiating a framework deal, which will hopefully lead to a final agreement by June. It would insure that Iran would not try to produce a nuclear weapon in exchange for the lifting of international sanctions. Tehran insists that it’s not pursuing a nuclear capability, but some nations have accused it of having a clandestine military nuclear program. As the talks passed the deadline on Tuesday, China warned that the parties must be willing to compromise to reach an agreement. “In this final phase all parties must be prepared to meet each other halfway in order to reach an agreement. If the negotiations are stuck, all previous efforts will be wasted,” Foreign Minister Wang Yi said in a statement after leaving Lausanne. The most vocal opponent of the negotiations, Israeli Prime Minister Benjamin Netanyahu, said it was time for the international community to stand its ground and insist on a better deal. “A better deal would significantly roll back Iran's nuclear infrastructure. A better deal would link the eventual lifting of the restrictions on Iran's nuclear program to a change in Iran's behavior,” he said. The Israeli government insists the lifting of sanctions would pave the way for Iran to acquire nuclear weapons and warned that it would not be bound by the deal, if it is reached in Switzerland. The former head of Israel's Atomic Energy Commission told RT that while Netanyahu’s unyielding position may be based on exaggerated fears, Tehran nevertheless gave cause for concern. “The capacity of Iran to build a weapon is not known. The only tangible element is whether they have enough enriched uranium to build a bomb or – some worry – whether they in the future would have enough plutonium to build a bomb. But this is not enough,” he told RT. “Nobody knows exactly what happened after they decided in 2003 to stop all development of nuclear weapons and how much they would need to get back to the program,” he said, adding that a robust IAEA inspection mechanism would help alleviate Israel’s fears. Jamal Abdi of the National Iranian-American Council told RT that he’s “pretty confident we’re going to see a deal” at the end of the current talks. “I don’t think the parties have got this far in order to see a collapse. I think that this is a moment for potential brinkmanship, attempts to get the best possible deal, the last mile of the race,” he said. Abdi believes that the signing of the deal may also lead to an improvement in relations between Iran and the US, which currently have no diplomatic ties. “If we can fix the nuclear issue we might begin to turn the page and shift the paradigm, and see increased, positive opportunities for diplomacy between the US and Iran, and other states in the region,” he stressed.